The Newfane Heritage Festival is an all volunteer event. Over 200 people give their time and energy to make this noteworthy arts and crafts fair possible. Most are from the immediate community, but many come from around Vermont and neighboring states. Volunteers work hard to give visitors a great experience. They also have fun doing so. Without a doubt, they are some of the friendliest people in the U.S.A.
Former Heritage Festival co-chair Ted Colligan thanks musician Dennis Waring (Guilford, VT) for his contribution to the entertainment of the weekend. They are in Waring's tent where he exhibits his unique musical instruments. 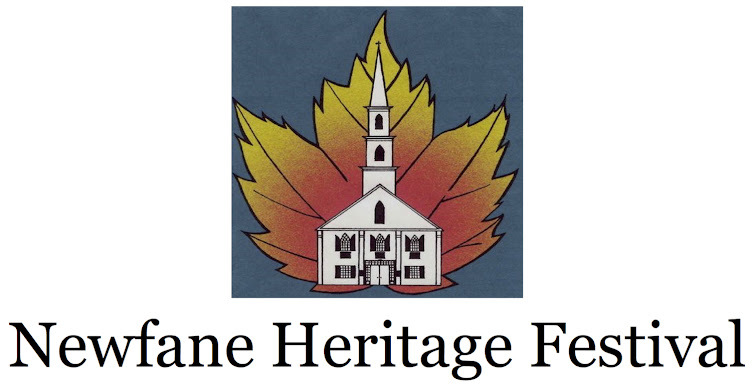 Heritage Festival is sponsored by Newfane Congregational Church. It helps insure that this small, but vital, church will continue to be an important presence in the community and for the community.